A dip in our lake will be a little more refreshing this week. Over the last two weeks the Lake temperatures have dropped from a swimming pool temperature of 80 degrees to a little more normal 74 degrees. Lower air temperatures and lots of rain might have helped lower the lake temperature. No surprise that the lake levels are also up. Higher water means the volunteer monitoring crew’s canoe did not scrap bottom at the launching pad despite the relatively heavier weight of one of the crew members. Secchi Disc readings bounced around 6 feet in the lake. Water clarity matches values the crew might observe in some of the pristine lakes in northern Minnesota (they do Secchi Disc readings for the MN DNR). Figure 1. 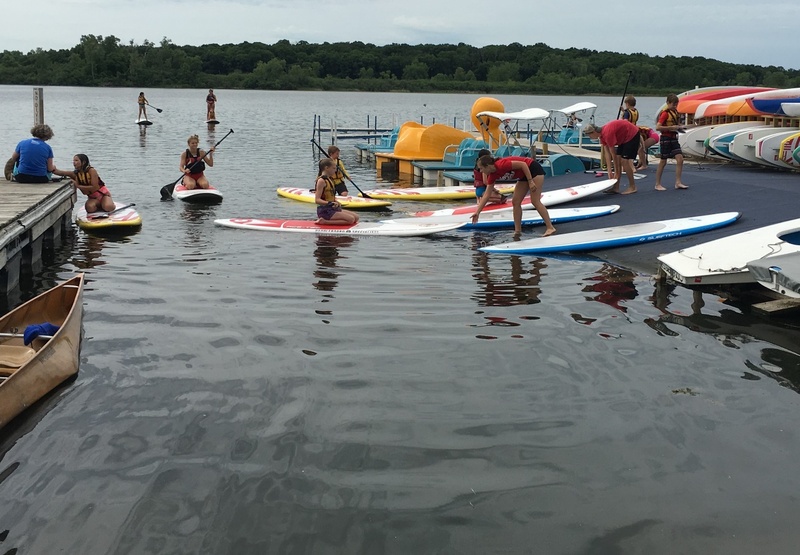 Paddle board fun at Camp Wingra. All the good news about water clarity and refreshing temperatures makes the lake inviting to all kinds of water sports! To add to that, the invasive aquatic plants are still below the surface in most places. As the crew conducted the sampling, it was good to see many people enjoying the lake. 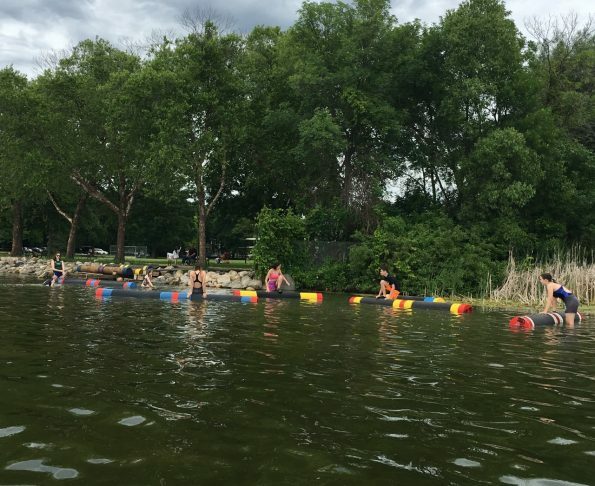 The kids enrolled in Camp Wingra were improving their paddle board skills (Figure 1). Log rolling students were learning to keep the logs spinning under the watchful eye of an instructor (see featured image). 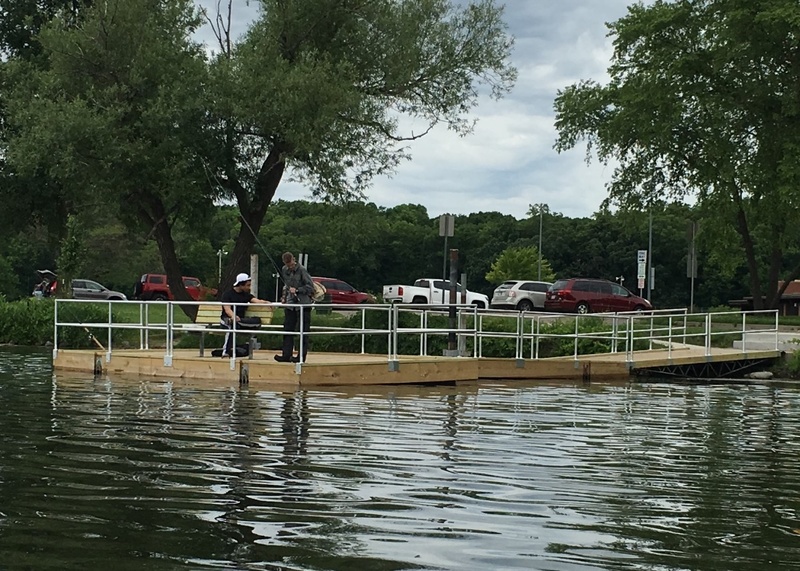 People were seen fishing on the new fishing pier at Vilas Park (Figure 3). New fishing pier at Vilas Park. Roger Bannerman is a Friends of Lake Wingra Board member and one of our water quality monitors. Thanks for your help, Roger!